ABOVE: An aerial view of Stockholm, Sweden. The first step in finding a place to stay in Stockholm is to pick the right neighborhood or island. How to get into and around the Swedish capital, with detailed advice on airport transportation, subways, buses, trams, ferries, excursion boats, driving, and parking. For an Absolut-ly chilling experience in Stockholm, belly up to a bar made of ice blocks harvested from the Torne River in Northern Sweden. The largest and most prestigious Swedish warship of the 18th Century sank on her maiden voyage in 1628. Today, the salvaged and restored ship is on display in a climate-controlled museum. The world's first open-air museum has more than 150 historic farm buildings, artisans' workshops, and houses from all over Sweden. 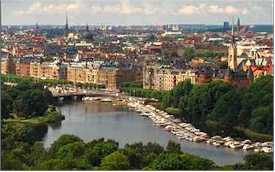 It's a favorite destination of tourists and Stockholmers alike.